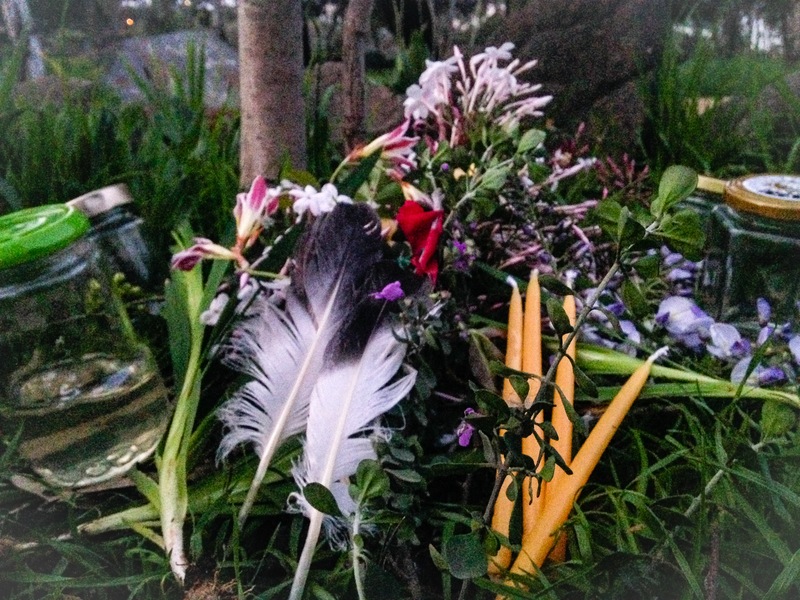 I celebrated the mid-point between Ostara & Litha yesterday – Beltane. A vision came to me, much like the image shown below, & I knew it was portraying an emotion, a sensation, a gift that was embedded in each & every creature on this wonderful Earth. We are created in the coming together of opposing forces that struggle with each other in a passionate frenzy in order to yield & accept each other wholly & deeply. I am shown this vision to ensure that in all things that I do, this is the energy that I hold within. That if there is peace within me then peace is the gift I have to give those that would receive it. Reality is created within, in the choice to either oppose & fight or yield in peace & accept this peace deep into my heart. To struggle is to go against the flow of Nature & do dishonour the Creator of us all. In a quite room create a small altar in the centre. Place the items listed above on the altar. Light the candle & sit quietly focussing in on the element of Fire. Then Light the incense & sit quietly focussing in on the element of Air. Hold the flowers & sit quietly focussing in on the element of Earth. Pour the tea & drink it quietly focussing in on the element of Water. Begin in your Power Place, taking a moment to explore its state & making any necessary adjustments. When you are ready, call in one of your Spirit Guides from the Underworld. Create a gateway to access your Underworld, set your Guards in place & journey through with your Spirit Guide. Find a cave & sit within it until you become one with the stone. Reach within & draw out anything that you are ready to unknow (anything that occupies your consciousness that is no longer helpful), pushing it out of you through your skin; this may be in the form of tattoos or scales or blisters, just let it naturally form on your skin. When you are done, take yourself deeper into the cave, where it is darker & colder & narrower. With mindful care & sacred thoughts begin to release your skin, slowly shedding it along with all of the things you are unknowing. When you are clear of this skin cover it with stones & say a prayer before leaving the cave. Play about in your Underworld & learn how it feels to be free from the skin you shed. When you are ready, find the roots of an Ancient & Sacred tree. Sit within the roots & focus in on something that you are in the process of actualising, dreaming, hoping for. With the assistance of your Spirit Guide, place this thing into an egg & nestle it in a safe spot at the roots of the tree. Repeat this process as many times as you like. When you have finished, give thanks to the tree for nurturing & protecting your eggs as they prepare to hatch within its roots. Before you leave, take a swim or a bath in a body of water. Upon leaving, give thanks to your Guards & your Spirit Guide. Take a moment to write your experience down & sip some more of your Herbal Tea. When you are ready, snuff out the candle & give your body a good stretch.